The ten plagues are generally understood to be God’s wrath visited on Egypt through progressively more horrific calamities, ultimately causing Pharaoh to release the Jewish people from enslavement. While this is the central theme of the story, the plagues evince more nuanced wonders from the hand of God. The story begins in the Book of Genesis with the chronicles of the Patriarchs, starting with Abraham and continuing through the families of the sons of Jacob, the twelve tribes of Israel. The Book of Genesis ends the with death of Joseph, who had become the Pharaoh’s chief lieutenant. After forgiving the betrayal of his brothers, Joseph was able to secure the Land of Goshen as a new homeland for the children of Israel in Egypt, where they multiplied and prospered. In the Book of Exodus, we see the children of Israel evolve from an extended family to a “People”. After the death of Joseph, and the Pharaoh he served, the new Pharaoh felt threatened by the presence of “the People of the Children of Israel”, who had increased and prospered so that “the land (of Egypt) was filled with them.” (Ex. I: 7-9). The Pharaoh enslaved them, both as protection from their increasing numbers and to profit from their forced labor. At the end of Exodus Chapter II, God hears the wailing of the Children of Israel and sets in motion the events that ultimately lead to their deliverance. The ten plagues were not randomly inspired; God’s message was truly deliberate. The Egyptians were idolaters; they worshipped the Nile River, the sun, and a host of beasts, including insects. By design the plagues attacked the pillars of Egyptian orthodoxy – the Nile was turned to blood, darkness smothered the sun, and exalted beasts were annihilated by disease and extreme natural forces. The plagues were also intended as “signs and wonders” through which God would become “known” in the land, by both Egyptians and Israelites, as the one and singular almighty God. In the end, Pharaoh’s belief in his own omnipotent godliness was shattered. All of Egypt was punished for its inhumanity, and Egyptian theology was humbled in the face of the God of the Children of Israel. Midrashic interpretations of the ten plagues are legion and varied. 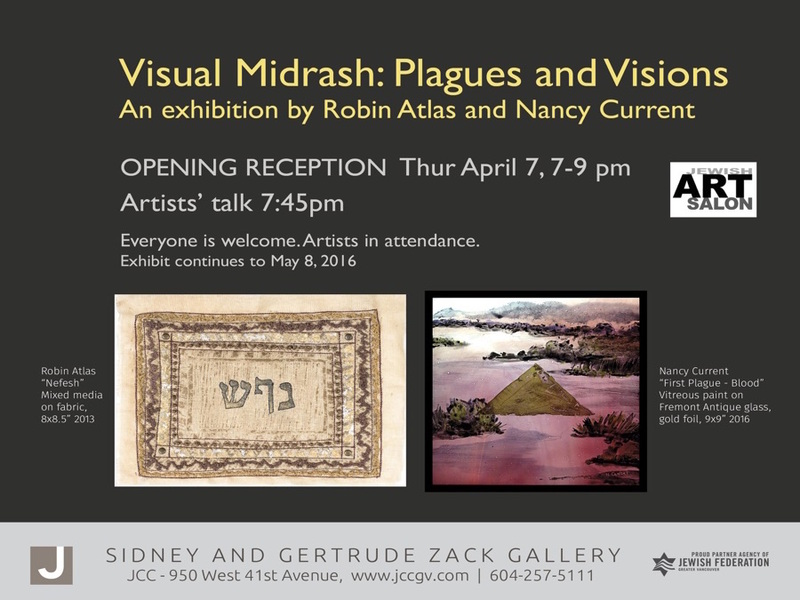 This exhibit of visual midrashim offers the story of the ten plagues through original imagery expressed through the creative use of different mediums. The artists welcome you to connect anew with the wonder of the stories told, and hope that you will appreciate the unique artistic voice that narrates them.